This is a wonderful hardstone cameo of a Roman lady, mounted into a decorated gold brooch. The gem is sculpted on a banded agate, of dark green hues. The workmanship looks Roman, it bears ancient encrustations from burial. The brooch has been tested at 14k gold, the pin is silver. 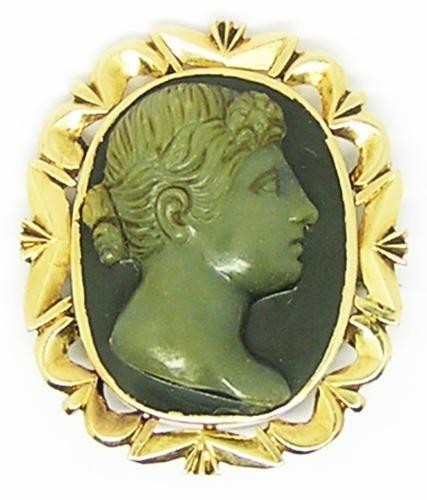 In my opinion, this cameo brooch is a later inspired piece, sold to an aristocrat on a Grand Tour. It is a great looking piece, in excellent condition.